Alright men! As father’s day approaches, we have you XY carriers on the brain. Last year, we published a post that answered the question: Should Men Be Using Skin Care Products? Of course, every guy is different! It's hard to write an article about men's skin care without using gender stereotypes worthy of head shakes and face palms. But I know some men shy away from skin care because they either think it's unnecessary or they don't think it's manly to spritz rose water on their face (it is). Developing a skin care routine (or updating your current one to be chemical-free) is about more than just looks (but it is partly about looks). Keeping your skin clean and moisturized is good for you! If you happen to attract dozens of suitors in the process, well that's just extra. Is Men's Skin Any Different from a Woman's? Men’s skin tends to be a little oilier than women’s. This isn't true for everyone, and we'll talk about how to determine your skin type in a second. Facial hair (if you let it stick around) can protect your skin from the elements, helping to stave off dryness that eventually causes wrinkles. Forgoing make up allows a lot of men to avoid the daily pore clogging that many women subject themselves to. Because men's hormones don't fluctuate throughout the month quite as intensely as women's do, men suffer less from hormone-related acne. Some people are very in tune with their skin’s characteristics. But others not so much. Think your skin is oily? Some people's skin actually needs moisture to help keep those clogged pores. Knowing your skin’s needs can help you choose the right products. Our article How to Determine Your Skin Type is a quick read that should make it clear to you which category your skin falls under. 1. Cleanse: You want to use a gentle cleanser that doesn’t strip your skin of its natural oils. The oil is there for a reason! If your skin tends to be on the oily side, use a cleanser like our Citrus Mint Facial Cleanser to remove dirt and balance your skin. If your skin is dry, stick with a moisturizing cleanser. Our Aloe Herb Facial Cleanser has coconut oil in it, so it moisturizes while it cleanses your skin. 2. Moisturize: This is the best way to keep your skin looking young. We’re huge fans of using oils to moisturize for a few reasons. Oils penetrate into the skin, bringing with them their nutrients (and the nutrients from any herbs infused into them). Making a lotion or cream requires water. Because water causes products to spoil, preservatives (usually chemical) must be added to ensure their shelf life (if you’re interested to learn how we preserve our lotions, check out this article on Aspen Bark). 3. Sun Protection: not optional! For some men, skin care can be just about solving problems: oily skin, clogged pores, dryness, et cetera. When those problems aren't there, they forget face wash ever existed. Good skin care habits can help prevent future problems, and using nourishing products can improve your skin over time. Why settle for “not dry” when you can have “touch-ably soft?” Not having clogged pores is cool, but having healthfully glowing skin is even better. Take it to the next level with a nourishing oil. Grape seed oil is great for oily skin. Its high linoleic acid content has been linked to a reduction of clogged pores, and its natural cleansing properties helps control oil. This light oil absorbs easily into your skin, thus it doesn’t leave you looking like you just built a wood cabin with your bare hands (even though you totally did!). It also helps tighten pores, something a lot of us crave! Hazelnut oil is another great choice for those with this skin type. It it lightweight and cleansing, with properties that help with oily skin. Like grape seed, you'll find that hazelnut oil soothes and moisturizes the skin really well, without leaving it greasy. Grape seed oil is light enough for your oily bits and moisturizing enough for your dry bits! Its high antioxidant content of Vitamin C and Vitamin E will help firm and tighten your look and brighten your skin tone. Sunflower seed oil is both oily skin-taming and highly moisturizing. Its fatty acids promote plumper skin, while cleansing properties help ward off dirt and clogged pores. Bonus! Jojoba oil closely resembles your skin’s own oils, making it a very effective moisturizer. It is said to reduce water lost from your skin without completely blocking it when put on, helping the skin look firm and taut. Sunflower seed oil's high antioxidant content helps protect from environmental stressors, making it a great member of your anti-aging team! Vitamin E evens out the look of your skin tone and reduces the appearance of wrinkles and fine lines. Hemp seed oil not only provides moisture at the time of use, but also helps the skin retain more moisture over time. Its properties help soothe and calm. Coconut oil is definitely experiencing some popularity these days! This oil proves itself time and time again to be an effective remedy to skin dryness and flakiness. Because of its large molecular structure, this oil is considered comedogenic and can cause breakouts for some who are prone to them. If breakouts aren’t a concern for you, this could be a great oil for soothing your dry skin. *A note about the coconut oil in Annmarie Gianni Skin Care facial oils, in case you're wondering if coconut oil is good for your skin: you’ll notice that we use coconut oil in our facial oil formulas for both normal/combination skin and oily skin. Before you start worrying that we’re pulling a Mean Girls and trying to sabotage your glow… we use fractionated coconut oil, which actually has a small molecular structure. This is why our herbal facial oils absorb so nicely into your skin and are not pore clogging! Jojoba, sunflower seed, and hemp seed oils are all part of our Anti-Aging Facial Oil formula. I’ve seen it tossed around that men age differently than women in this way: whereas women age gradually all over their face, men age in “jumps.” Their extra collagen and generally oilier skin keeps them looking younger longer, but when they age, they see rapid aging in short chunks of time. The first signs of aging are seen in the eyes. The evidence for this trend is weak, but it’s an interesting concept that you may have noticed. For those whose noggins have seen harrier days, it’s time to start thinking about your scalp health! The most important thing to do is protect your head from the sun, as the skin in this area is very delicate (not to mention the importance of the contents it encloses!). Make sure to apply sunscreen or wear a hat every time you are going to be exposed to the sun! Moisturizing your scalp will keep it looking and feeling its best. Avocado oil is a great moisturizer. My pops uses jojoba and his scalp looks pretty radiant to me. For those with curly or coarse hair, beard hairs can sometimes grow back into the skin, causing irritating bumps. These ingrown hairs are both painful and embarrassing. How can you avoid them? First off, keep your facial hair moisturized with previously mentioned oils. 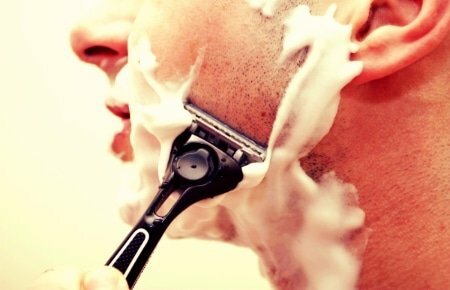 Next, shave in the direction that your hair naturally grows, and shave the same way everyday. This can also help train some of the rebellious hairs so that they grow in the same direction. If you’re growing out your beard, you may need to brush it to prevent ingrowns. When curly hairs get to that length where they can do a round two into your skin, brushing your beard can stop them in their tracks. Boar bristle brushes seem to be popular beard tamers. What’s important is that the bristles are close together. You can make brushing your beard part of your normal shower routine. Do it at the end, when your hair has softened from the warm water. Simply brush your hair in the direction that you want it to grow. Make sure to wash your pillow cases regularly. Oil from your hair and general dirt from just living life can show up here and clog your pores. Keep sugar and caffeine under control. Caffeine stimulates your bodily systems, including those that produce oil. So while you heroically accomplish tasks that would normally take you years to complete, your skin gets oily and can potentially break out. Sugar is a stimulant as well. Check out this article on face mapping. The location of your occasional break outs can give you hints as to what is causing them. Using harsh products that strip your face of its natural oils will often just exacerbate problems. Even if your skin reacts okay to these toxic “solutions,” it can actually become addicted to these chemical ingredients. Your pores absorb what you put on them, so choose your ingredients carefully! Some people are blessed with annoyingly great genetics, some have makeup talents that I can only describe as pure witchcraft, and some have taken the time to development good skin care habits (and of course a lifestyle to match). Establishing a regular skin care routine allows you to really figure out what works for you. It also just feels good to take care of yourself. Take back the spa, men! You can pamper, too. So is this there a huge difference between his and her skin? No, not huge. But how else was I supposed to work in writing about beards? Do you have any tips for beard care? Loughran, Joni. Joni Loughran’s natural skin care : alternative & traditional techniques. Frog ; [Emeryville, Calif.] : Distributed to the trade by Publishers Group West, Berkeley, Calif, 1996. Hi. I really liked your blog post. I am in habit of writing skin care posts only for women, but now i m thinking to write for men also. It will really help it. I have very dry skin and have been using Bio oil every second night on top of nightly use of Hunterlab’s skin care range, (quite new but very good stuff http://www.hunterlab.com.au ) which includes cleanser/scrub, moisturiser and anti-aging serum. I think this combination works great for me, my face feels a lot fresher and more hydrated!